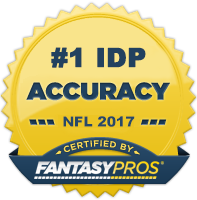 OK. Let's start things off by going through some IDP news, notes, and commentary from Week 14 of the NFL season. With the regular season nearing it's end, several teams placed a few big name players on season-ending IR. Robert Quinn, T.J. McDonald, Antrel Rolle, Derrick Morgan and William Moore are all done for the year. I don't see a ton of obvious value with any of their backups at this point. Rolando McClain has been playing well as of late but had to leave last week's game with a head injury but later returned. He was placed in the concussion protocol after experiencing headaches after the game, however. It's not yet known if he actually suffered a concussion but he remains questionable for this week's game. We should know more about his status later in the week. Paul Posluszny missed last week due to a broken hand. He was replaced in the lineup by Jordan Tripp. He's hoping to be cleared for Sunday's game against Atlanta. If he isn't, Tripp becomes a sneaky waiver wire scoop up against an Atlanta team that allows the 2nd most points to linebackers. Denver linebacker Danny Trevathan was unable to play last week as he still wasn't 100% recovered from the concussion he suffered in the previous week. Bump up Brandon Marshall slightly if Danny T misses another week. With both Dont'a Hightower and Jamie Collins being banged up off-and-on throughout the year, Jonathan Freeny has seen a good amount of playing time. He suffered his own injury last week, coming out of the game after just 5 snaps. Jerod Mayo played nearly every down after that and racked up 8 tackles in the process. If Freeny and Hightower are both inactive, Mayo could be an intriguing Hail Mary option for IDP owners scraping the bottom of the waiver wire barrel. Kam Chancellor is recovering from a tailbone injury he sustained during last week's game against the Ravens. He's not likely to practice today and chances are diminishing that he plays in Week 15. After posting an 11-tackle game a week ago vs the Packers, Isa Abdul-Quddus only managed a measly solo tackle against the Rams. Granted, the Rams have been a poor matchup for defensive players. However, it's very concerning that Quddus only saw 44% of the defensive snaps. The Lions have been shuffling defensive personnel around from week-to-week making a lot of their players untrustworthy to start. And Quddus now falls into that bucket. Morgan Burnett has been decent since his return from injury but isn't close to the DB1 status he enjoyed last year. The Packers secondary is chalk full of talent so Burnett is probably going to have a harder time reaching his 2014 numbers and his 1 tackle performance last week is discouraging. He shouldn't be dropped in most leagues, we just need to temper our expectations down to the DB2- range. Dannell Ellerbe finally returned to action after missing several weeks with a lingering hip injury. However, he only saw 60% of the defensive snaps and is a fantasy reserve moving forward. DE DeMarcus Lawrence (DAL) - With Greg Hardy absorbing a majority of opposing offenses' attention, DeMarcus Lawrence has been seeing a ton of isolated matchups and he's been winning a lot of them. He's had 5 sacks in his last 4 games and has 2 top 10 fantasy matchups over the next two weeks with Jets and Bills, respectively. This said, Lawrence should be one of the top waiver wire moves in most moderately deep leagues. DE Jabaal Sheard (NE) - Sheard started off well, producing 4 sacks in his first 5 games. Injuries caused him to miss a handful of games however and he has since fallen off the fantasy radar. If his two sack performance last week is any indication, he seems to finally be fully healthy and back on the right track. He has a plus matchup against the Titans this week and should serve as a solid DL3 for most owners. DE Desmond Bryant (CLE) - Although they have been better in recent weeks, the Seahawks' offensive line still leads the NFL in points allowed to defensive ends. Bryant is coming off his best game of the year (4-1-1.5, TFL, FF) and should have a good shot at 3-4 tackles and a sack this week. He will likely fall into the DL40 range in my Week 15 IDP Rankings. OLB Chad Greenway (MIN) - Greenway has lost a step or two over the last year or so, but has still been productive when given an opportunity to play every down. With Anthony Barr questionable to return from injury this week and Eric Kendricks still recovering from a rib injury, Greenway makes for a fairly safe LB3+ option. If Barr remains out, I would project 7-8 tackles from the former Iowa linebacker this week. LB Danny Lansanah (TB) - It was Bruce Carter, and not Danny Lansanah, that assumed the every down linebacker duties last week from the suspended Kwon Alexander. He came through with 8 total tackles and a sack. However, he left the game due to injury and reports indicate he's likely to miss the remainder of the season. This said, Lansanah should now be a fairly safe bet to be a three-down linebacker and post decent LB3- numbers. Just keep in mind the Rams matchup this week is a very bad one. Consider him a LB4 pickup in deeper leagues. OLB Jelani Jenkins (MIA) - I've been a big fan of Jenkins dating back to last year. After a strong two weeks to open the year, he really tampered off over the next couple of months. However, he led all Dolphins linebackers in tackles last week with 8 and seems to be on the path to redemption. Obviously he's a risky player to rely on during the fantasy playoffs, but he's got the Chargers this week who give up the #1 most points to linebackers which creates a nice incentive for owners looking for an upside play this week. OLB Elvis Dumervil (BAL) - I've gotten requests to include more pass-rushing LB matchups in my column, so that's what I'm doing. With six sacks on the year, Dumervil has been productive, but not exceptional. However, I like him for a sack or two this week against a Chiefs offensive line that has surrendered the most sacks in the league with 40. S Jaquiski Tartt (SF) - If you are a consistent reader of this column, then hopefully you already have Tartt rostered as I've mentioned him a few times over the last several weeks as a player to pickup. If not, hopefully he's still available as he's been producing steadily over the last month. He had 8 tackles, an INT, and a PD last week and will look to continue that performance this week. DB2-. S Michael Griffin (TEN) - Griffin really struggled early this season - failing to post more than 4 solo tackles in any of the season's first seven games. Since then however, he's averaged 7.5 total tackles per game. He's been extremely consistent over this span and has a plus matchup against New England. He makes for a nice high floor DB2 option moving forward. S Anthony Harris (MIN) - Harris, an undrafted rookie out of Virginia, got the start at safety in replace of Harrison Smith. He posted a strong 8 tackles (7 solo). If Smith misses another game, Harris becomes a fairly viable DB3- option against the Bears this week.